Here we present the English version of “The Japanese Breast Cancer Society Clinical Practice Guidelines for systemic treatment of breast cancer, 2015 edition.” which was revised in July, 2015. Differences from the most recent previous version include the following newly added clinical questions: CQ19, CQ21, CQ26 and CQ35. 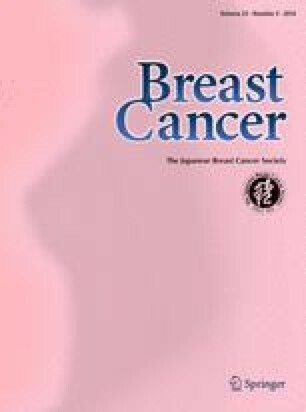 This article is an English digest of the Clinical Practice Guideline of Breast Cancer 2015, published by Kanehara & Co., Ltd. Details of recommendation grades were explained in the previous report (Breast Cancer. 2015;22:1–4). TT received research funding from Takeda, Daiichi-Sankyo and Novartis Pharma. MT received honoraria from AstraZeneca. YY received honoraria from Chugai pharmaceutical and Novartis Pharma, and research funding from Taiho Pharmaceutical. FH received honoraria from Chugai pharmaceutical, and received research funding from Eisai. JT received honoraria from Eisai. YI received manuscript fees paid from Chugai, Eisai and Novartis, and research funding from Novartis, Chugai, Parexel, Eisai, Sanofi, Taiho, EPS, Daiichi-Sankyo and Boehringer Ingelheim. HM received honoraria from Chugai pharmaceutical, AstraZeneca, Eisai, Novartis Pharma, Daiichi-Sankyo, Taiho Pharmaceutical, Boehringer Ingelheim Japan and Ono Pharmaceutical and received research funding from Chugai pharmaceutical, Daiichi-Sankyo, Eisai, Nippon Kayaku, Novartis Pharma, Pfeizer Japan and Sanofi. Goetz MP, Sun JX, Suman VJ, Silva GO, Perou CM, Nakamura Y, et al. Loss of Heterozygosity at the CYP2D6 Locus in Breast Cancer: implications for germline pharmacogenetic studies. J Natl Cancer Inst. 2014;107(2). doi: 10.1093/jnci/dju401.